Pi Pi Island Thailand dazzles and mesmerizes all that visit her. Such is the dramatic nature of the scenery, the fun and laid back atmosphere of the places to stay, it lives long in people’s memories. If time is short, visiting for the day on a 'one day tour' also allows you to experience the magic. Pi Pi Island is actually 4 main islands, Pi Pi Ley, Pi Pi Don Bamboo Island and Mosquito Island and this archipelago is 45 km from Phuket and Krabi. There are also further the huge rock islands of Koh Bida (diving), Koh Samui (diving), and at Nui Bay (snorkeling). The most celebrated attraction of Pi Pi Island is Maya Bay which was the main back drop for the Movie The Beach with Leonardo Di Caprio. Vertical walls covered with clinging vine and jungle, the brilliant sandy bay of 'The Beach' and the shades of blue of the sea and reef make this a picture perfect place to sightsee, beach comb or may be snorkel in the reefs. Out at the entrance to the bay, the sea plunges to 18-25 meters and the sea bed is covered with gigantic 10-15m high boulders, the perfect place for diving, swim through and exploration. In low season or if you like the challenge, there is a neat but rocky path from the opposite bay of Loh Samah. 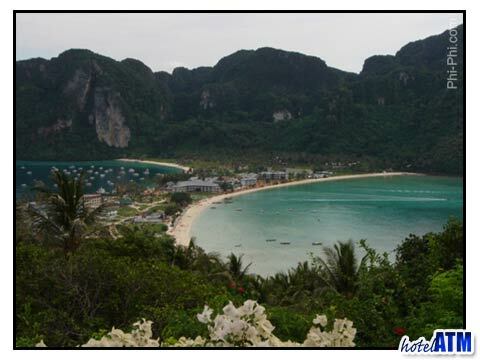 The Loh Samah to Maya Bay walk through takes you through some primeval jungle scenery at the back of the Pi Pi Ley island in sharp contrast to the clean lines of the beach and shoreline. The main accommodation is on Pi Pi Don and this is where the Pi Pi Island ferry arrives in from Phuket, Krabi or Koh Lanta. The ferry pier is where the main Pi Pi Don village is located, a bustling place full of diving schools, restaurants, cafes, shops and bars as well as the local market and a host of beachfront resorts. This is the heart beat of the island and as the rest of Pi Pi Don is mountain, it is the only place where tourists and locals congregate as the other resorts sit perched on the edge of the beaches at Long Beach, Loh Bagao Beach and Laem Tong Beach. The main village sits between 2 famous bays, Tonsai and Loh Dalum, both famous for different reasons. Loh Dalum is more laid back and is the social place to hang out all day, maybe hire a kayak, play volleyball or stay on for a dance at venues like Slinky Beach Bar. Tonsai Bay is the deep water side where the ferries arrive and the walls of the cliffs of Pi Pi Don impose their presence on all that visit. This is also where most of the tours depart from, where there is some exciting rock climbing, cliff jumping and snorkeling along the reefs. Pi Pi Island is the place for a tour. The main village or the resort centres are so hemmed in that after an hour you have seen your beach head. Tours to other beaches sightseeing come in many forms and comfort levels from the cheap and cheerful longtail tour of the islands to the exuberant speedboat tour that gets some much done. Pi Pi Island Phuket tours are very popular with those that see the pictures of Pi Pi Island for the first time when they stay on beaches like Patong and Karon. They are drawn to beauty, the nature and the chance to snorkel the reefs. The Sea Angel Cruise and the Phuket Pi Pi Island tour by Speedboat are the main tours on offer. 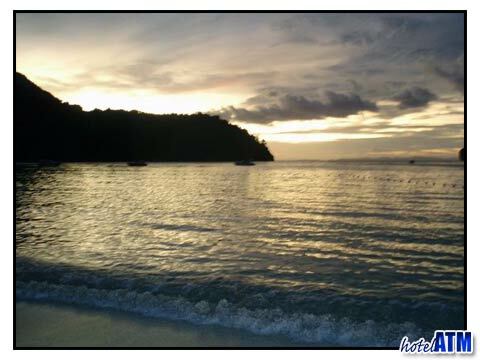 For all the tours, whether you are staying on Pi Pi Island, Phuket or Krabi see Pi Pi island tours page. No place in Thailand is quite like Pi Pi Island for diving. Scores of dive sites surround the islands and the off shore reefs so that Pi Pi Island is one of the true meccas for the sport. The most popular dive sites surround Pi Pi Ley and Koh Bida. Days can be spent exploring the great walls and reefs in the 18-26 meter range of diving or further afield at Shark Point, Garen Heng, Hin Daeng, Hin Muang or the Wreck. As Pi Pi has a larger number of shallow reefs it is also a mecca for people wanting to learn to dive. Independent Dive schools teach the PADI and SSSI qualification and are mainly found in the main village but the luxury resorts to the north of Pi Pi have their own in-house operations. One of the great advantages of Koh Pi Pi island Diving is that the reefs start just 5 minutes from the dive pier so that a 2 dive day can be organized and completed so that there is plenty of time to explore the island after. This makes for efficient diving and is great if the partner is addicted to the bubbles. Diving can also be organized so that the dive boat get backs before the afternoon ferries back out to the mainland. The Pi Pi Island ferry page explains all you need to know on how to get to Pi Pi Island and how to book those tickets. Likewise the Pi Pi Island accommodation page helps you find a place to stay.